Jewellery is where personal stories, luxury and traditional craftsmanship intertwine, and any aspiring designer needs to have a handle on a broad mix of artistic, technical and commercial skills. Want to know what it takes? Vogue speaks to six industry leaders for a step-by-step guide to becoming a jewellery designer. The breadth of a jewellery designer’s job depends on whether you work in-house for a brand or set up on your own. Either way, the most important and consistent part of your role is to provide a strong artistic vision. 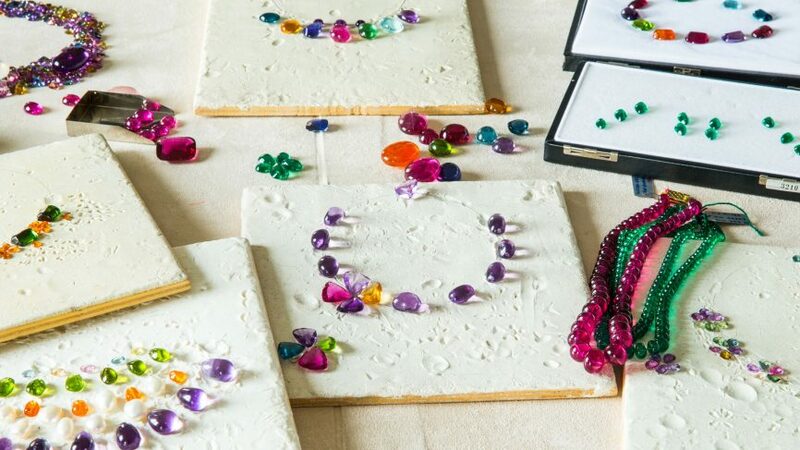 At Bulgari, creative director Lucia Silvestri lays out coloured gems, picks combinations and fixes them in putty to model her preferred constellation. More generally, the process involves creating a technical sketch, modelling it with computer-aided design (CAD) software and selecting the stones. Production then follows, starting with a 3D-printed prototype and ending with the work of the goldsmith, which includes metal-casting and stone-setting, as well as more niche technical tasks like engraving and enamelling. Unless they are going it alone, most designers won’t be physically involved in this part of the process—but they’ll still need to understand the mechanics of how jewellery is made if they want their designs to be wearable. Whether you want to design in-house or run your own brand, the first thing you need to do is get educated. And while you can expect to be in school for up to six years, the good news is there’s a lot of flexibility to jewellery design courses, and no right or wrong path. London’s British Academy of Jewellery (BAJ), for example, offers programmes ranging from six months to three years, including paid apprenticeships. Depending on the level students apply for, the interview process can include a bench test—in which you’ll show off your measuring, cutting, forming and soldering skills—and a portfolio review. Alternatively, you could hone in on your preferred craft. Bille Brahe trained as a goldsmith for almost five years at the Copenhagen Technical School of Design & Technology before enrolling on an MA course at London’s Royal College of Art. “Without having the craft, [the design process] becomes quite hollow,” she explains, adding that the technical skills you acquire as a goldsmith mean you can make a living doing this as well as a designing. Or how about gemology? Among Silvestri’s team at Bulgari are graduates of the European Institute of Design (IED), the Academy of Costume and Fashion in Rome, and the Gemological Institute of America (GIA). Other designers place less emphasis on technical expertise. “I don’t think it’s useful to go deeper if you [want to] create your own brand,” says French designer Anissa Kermiche, who advocates a short technical course to provide the necessary introduction to 3D printing, sketching and stone-setting. It suited her perfectly, combining two technical courses at the BAJ—CAD for jewellery production and Level 2 jewellery manufacturing—with a creative BA in jewellery design at Central Saint Martins. Sharp sketching skills can also get your foot in the door at a big brand. For Akira Haga, general manager of merchandise development at Japanese heritage jeweller Mikimoto, having a degree from an art school or college is preferable to technical metalworking skills. “It doesn’t really matter what course designers come from,” he says, “[but] they need the basic skills for sketching.” Mikimoto’s designers come from different art and design backgrounds including fine art, Japanese traditional art and industrial design. Silvestri’s advice on getting that first break? “Shadow expert leaders, maybe abroad, even as an office assistant,” she says. And once you’ve got your foot in the door for an interview, you’ll need a strong portfolio of existing work—ideally between six and eight projects, showing competency at technical sketching and CAD, as well as your research and consideration of materials. When Bulgari interviews new recruits for its Jewellery Academy, the team looks closely at a young designer’s ability to turn an idea into a realistic design. “Creativity shouldn’t be an end in itself; it needs to be realised in a wearable piece,” Silvestri continues, adding that sketching ability, manual skills and in-depth knowledge and passion for the brand will also be scrutinised. The BAJ advertises job offers through its social channels, but Boons also advises students to keep an eye on trade publications and websites such as Benchpeg, Retail Jeweller, The Artists Information Company and The National Association of Jewellers. In some cases, it’s worth reaching out to companies directly. “Cartier or Tiffany & Co might not post their roles,” she explains, “so you should politely and respectfully try to find a way to let them know that you exist. Make sure you remind them from time to time, [stressing] why you would be a great candidate to join them.” Finally, the jewellery trade still relies on word of mouth, so networking and applying for competitions such as HRD Antwerp or Talente in Munich—which in turn can lead to exhibitions—is essential to let yourself be known to as many industry professionals as possible. The job interview process varies depending on the dimension of the company and the role you are seeking to fill. Small businesses might require only one stage, but established companies can involve up to five, including bench tests, portfolio and CV reviews, interview panels and, in some cases, a written exam. “Research is key,” says Boons. “Students should look into why their skills can contribute to the company, read their strategic plan and see how they could complement it.” If you can’t get your dream job, the advice is to not give up and instead take steps that will ultimately bring you closer to your goal. “[Ask yourself] what job could get me the experience that they are looking for? It’s about planning and being resilient,” adds Boons. If you’ve been hired by a big brand, expect to keep learning and training for the first two years of your career. “School is good, but practice is essential,” sums up Silvestri. “Even if our new recruits have commendable degrees, they always start by copying jewellery sketches from the Bulgari archives.” It’s the same at Mikimoto, where trainees spend 18 months learning Japanese traditional ink and fine-point brush techniques while sketching the entire Mikimoto design archive. The purpose of all this sketching is to better understand how to manage your artistic goals with the mechanics of making jewellery. “Pearls are spherical and it’s quite difficult to incorporate round objects into jewellery,” explains Haga. “It’s not something that you can learn in a day or two; you need a lot of experience.” At Bulgari, by working side by side with senior staff, new hires learn how to choose gems. “Don’t buy a gem only because it’s beautiful and you like it, but because you already know how to use it,” says Silvestri. You’ll also understand how to prioritise harmonious shapes, colours and proportions in your sketches. At Mikimoto, designers compete to have their sketches chosen among dozens of other drafts, so it’s important to learn how to sell your design internally. “We line up all the rough designs on a table, followed by each designer’s presentation,” explains Haga, adding that communication skills are also essential between designer and craftsman. It’s this latter relationship that’s essential for a designer to master, as it’s the artisans who will interpret your design. This is easier in smaller houses; Bille Brahe, for example, manages a team of seven in her Copenhagen workshop. For bigger houses, it can be more complicated: at Cartier, the designers and craftsmen work under the same roof to ensure smooth communication, with Pierre Rainero, the brand’s director of image, style and heritage, describing “an endless discussion between the designers and the jewellers.” Bulgari has a high jewellery workshop near the design offices in Rome where the most complicated one-off pieces are produced, along with a new factory in Piedmont for less complex metalwork. When launching her brand, Kermiche transformed her house into a jewellery lab, crafting her first prototypes with small, relatively inexpensive stones. “I managed to save money because I spent [the previous] years learning how to make my own prototypes, so I didn’t have to spend on manufacturing,” explains the designer, who at the first stage was also financially supported by her uncle. “I don’t recommend mass producing right away,” adds American designer Jennifer Fisher, who was a wardrobe stylist before launching her own label. “You have to start small, grow from there and see what is successful.” Fisher made some of her signature personalised dog tag charms for clients and celebrities on set, before setting up a customer-facing website, while Bille Brahe began making bespoke pieces while sourcing the financing for her brand. For the investments you do make, be strategic. “[It was important] getting a team that had the experience I didn’t have,” says Bille Brahe, while Fisher adds the simple but all-important advice to “make sure that the infrastructure of the business is sound”. Creativity and innovation are also essential qualities for prospective students, she continues—especially if you’re applying for your first course. “I’m not saying you have to reinvent the wheel each time,” she tells Vogue. “But if you are going to put other objects on the planet, we’ve got to make sure they say something”. Hiring a PR agency is another option, as its expertise can help guide an emerging brand through press, promotion and sales—though it can also add to the financial burden. “We worked with a showroom for a little while and they were just not representing us correctly as a brand,” says Fisher. “We do all of our sales in house now, and it’s much more successful”. “I think it’s very important to respect relationships in this business, stay true to your word and respect the people who have respected you,” adds Fisher. Barneys was the first US brick-and-mortar department store to approach her and she has maintained that relationship exclusively ever since. Self-promotion is essential: learn how to use social media to your advantage by creating a strong visual identity and connect with journalists, clients and retailers. Be mindful of your relationship with retailers: nurture them with personal meetings and use them to better target your designs.